On Jan. 21, 2019 Arthur Klopfenstein, peacefully passed and entered the Kingdom of Heaven. Arthur was born in Akron, Ohio on May 22, 1927 to John and Adella Klopfenstein. He proudly served his country on the USS Missouri during World War II and Korea as a welder, he was honorably discharged as an Petty Officer Third Class. After leaving the Navy he then met and was wed Carmel Jean Prete and they remained married until her death in 2009. He continued his passion for welding as a welder for Ford Motor Company from 1956 until his retirement in 1995 at the Walton Hills stamping plant. 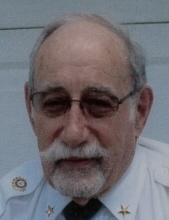 After his retirement he remained active serving as Honor Guard for Brunswick American Legion Post 234 and was actively involved in the activities of the legion. Arthur is survived by his son, Stephen (Celeste) Klopfenstein; his grandsons, Stephen (Alexis), Kevin (Sarah) and Brandon (Sara) Klopfenstein; and 5 great grandchildren. Funeral and Legion Services will be Friday, 1:00 pm at H B Moore Funeral Home, 936 North Main Street, Akron, OH 44310 (corner of N. Main St. and Mildred Ave.). Visitation will be Friday from 11:00 am to 1:00 pm at the Funeral Home. Arthur's final resting place will be Northlawn Memorial Gardens. In lieu of flowers please make donations to American Legion post 234 Brunswick OH. You are invited to hbm-fh.com to view Arthur's tribute wall, offer condolences and share memories.